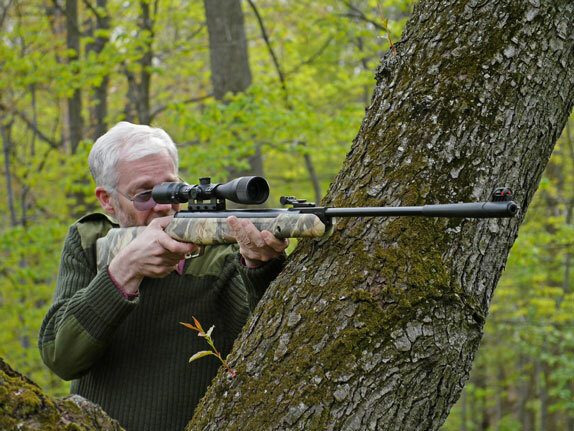 Here's a review of the Stoeger X50 compared to its' close cousin, the Benjamin Super Streak. Both the X50 and the Super Streak are manufactured by BAM in China and they're basically the same gun. Quality and performance are very similar. But some detail design decisions make the Benjamin - literally - a pain in the neck to shoot, while the X50 is comfortable and well-balanced. So, a win for Stoeger on points. You can read the review in full in the window below. Your comments are welcomed! This Archer Airguns "Gold Service" test target is from a QB78 Deluxe we shipped to a customer recently. This specific gun included our Two Stage Trigger Kit with a lighter than normal pull weight. It was also fitted with a replacement breech seal from our QB78 "2X" Seal Kit, giving a muzzle velocity well above the approx 600fps normally attained by these guns at around 65 degrees F.
This test was shot - as usual - using a red dot scope. Even better accuracy would be obtained using a scope. 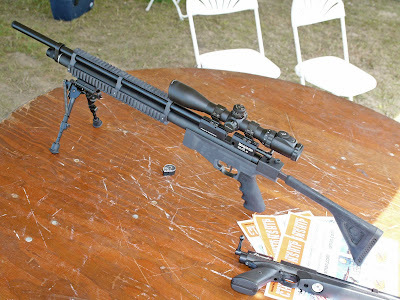 The Stoeger X10 and the Crosman Quest 1000X are "the same" air rifle. Both are manufactured by BAM in China and carry US brands. Both are based on the B18/19 platform and have similar specifications. So why does the Stoeger cost over $20 more than the Crosman. And is it worth it? I've been asking myself these questions for some time. So, in order to answer them - at least to my own satisfaction - I compared the two guns side-by-side. Having done this, it seemed that others might be interested, too. You can read my report here. - In a side-by-side test, the Stoeger X10 provided much higher muzzle velocity and improved accuracy over the Crosman Quest 1000X. - The X10 has a mounted, sighted-in scope. 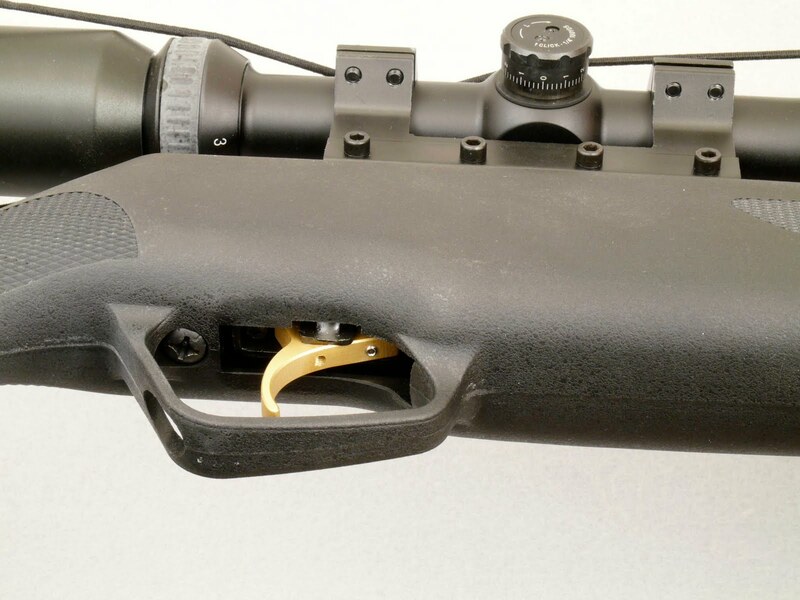 The Quest supplies the same scope and mounts but requires the customer to assemble and sight-in. - The X10 stock is significantly superior in wood, finish and shape. 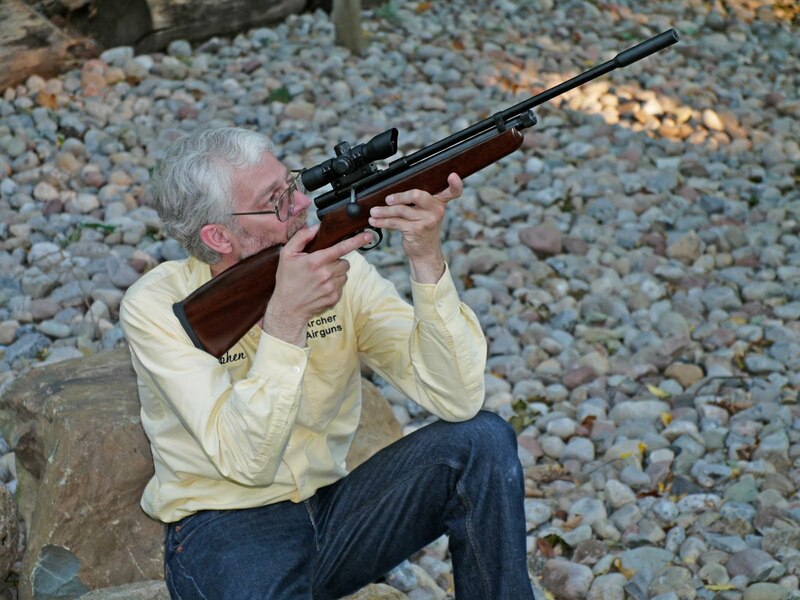 - The Stoeger has an excellent automatic safety, the Crosman's is manual only. Remembering that these air rifles are mostly purchased by shooters with limited experience, this is a big safety feature. - Open sights on the X10 are much better than the Quest. - The X10 has a scope stop slot milled into the receiver, compared to the screw-on Quest scope stop. - Overall "feel" and appearance of the X10 that of a more expensive gun. The Quest looks and feels like a cheap gun. Just available on our "Specials" page are some new combination packs of Archer Airguns most popular parts kits to tune QB78 family air rifles, including the QB79, AR2078 and AR2079. Each pack provides significant savings on the prices of the individual kits. The Archer Airguns Performance Pack for QB78 Family Airguns includes our XP Tune Kit to add 100fps to the muzzle velocity of a factory QB78, the HDD (Hammer Debounce Device) that provides over 40% more shots per fill of CO2, and our Two-Stage Trigger Kit that improves trigger "feel", and therefore, accuracy. 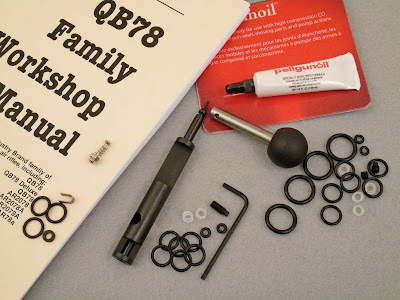 There's also a QB78 Rebuild Pack, including seal kit, workshop manual and Crosman Pellgun Oil, a QB78 Handling Pack with Muzzle Brake, Oversize Bolt Handle and sling kit with swivels. And for the person who wants it all - or almost all - we have the Full House pack for QB78 Family Airguns. This includes XP Tune Kit, HDD, Two-Stage Trigger Kit, Seal Kit, Oversize Bolt Handle, Workshop Manual and Crosman PellGun Oil. Everything you could want to up-grade your QB78 family air rifle! Of course, these kits also fit the corresponding Tech Force TF78 and TF79 air rifles, as well as those sold as SMK models in the UK and under different names in other countries. Free Pellets with Stoeger Airguns - a $31.00 value! For a limited time, you can get 1,000 free .177 caliber premium pellets - a $31.00 value - when you purchase a Stoeger X10, X20 or X50 air rifle combo from Archer Airguns! This special promotion is unique to Archer Airguns and gives you a chance to save money and try these new, premium, German-made Stoeger pellets before they officially reach the market. 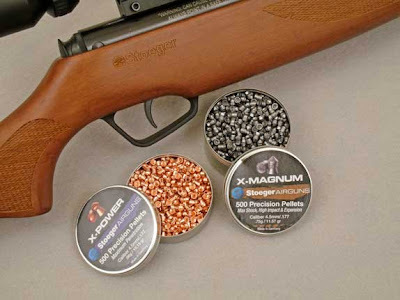 For the remainder of 2010, every Stoeger air rifle combo we sell will ship with 500 Stoeger X-Power premium heavy pellets and 500 Stoeger X-Magmum ultra-heavy pellets. The X-Power pellets are premium, copper-washed, domed, heavyweight hunting pellets weighing 10.19 Grains. The MSRP for these German-made pellets is $16.00 for a tin of 500 in .177 caliber. The X-Magnum pellets are also German-made. These are ultra-heavy pointed pellets with a weight of 11.57 Grains and an MSRP of $15.00 per tin of 500 in .177 caliber. So here's your chance to receive 1,000 free pellets when you purchase a great-value Stoeger Airguns combo from Archer Airguns, and be among the first to try these exciting new pellets. But be quick, this offer will not last forever! Given the excitement over the QB78 Hammer Debounce Device (HDD), it's not surprising that many people have asked if it will fit the Crosman 160. But does it? Here's what I've found through testing on my own Crosman 160 - a "Model 3" with the cast trigger guard (same as the QB78 style). The short answer is "yes, the QB78 HDD fits the Crosman 160". But, unfortunately it doesn't work like it does with the QB78 - at least not on my Crosman 160. Now I purchased my Crosman 160 several years ago at the Baldwinsville Airgun Show as a "leaker". I don't know what it's life was before that but I fitted it with an Archer Airguns "2X" Seal Kit and replaced the original valve with one of our replacements. It's a strong gun, giving about 580fps at 65 degrees F and has a very smooth and light trigger pull weight of 1 lb 9 oz. As this is my only Crosman 160, I can't make comparisons with other examples of the same model. But, what's for sure is that the QB78 HDD sadly doesn't provide any benefit to my Crosman 160. Well we know from our extensive testing that the QB78 HDD works best with shorter hammer springs and my 160 hammer spring is long and feels stouter than the QB78 versions. It may simply be over-powering the HDD. 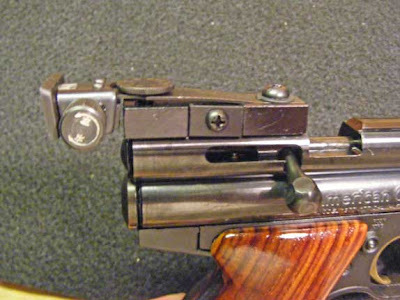 Also, we know that the QB78 HDD doesn't work with guns that have had their hammer pin slots polished, as some people do when tuning these guns. Over the course of maybe 50 years, the hammer pin slots on my 160 have effectively been polished by firing innumerable times. 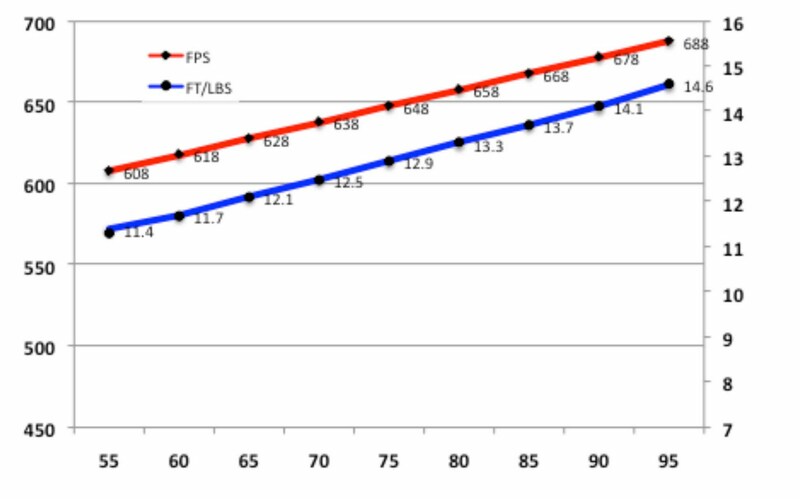 Probably a combination of both factors has rendered the QB78 HDD unable to show it's 40+% improvement in muzzle energy and useable shots that we've seen in multiple test on QB78 family air rifles. 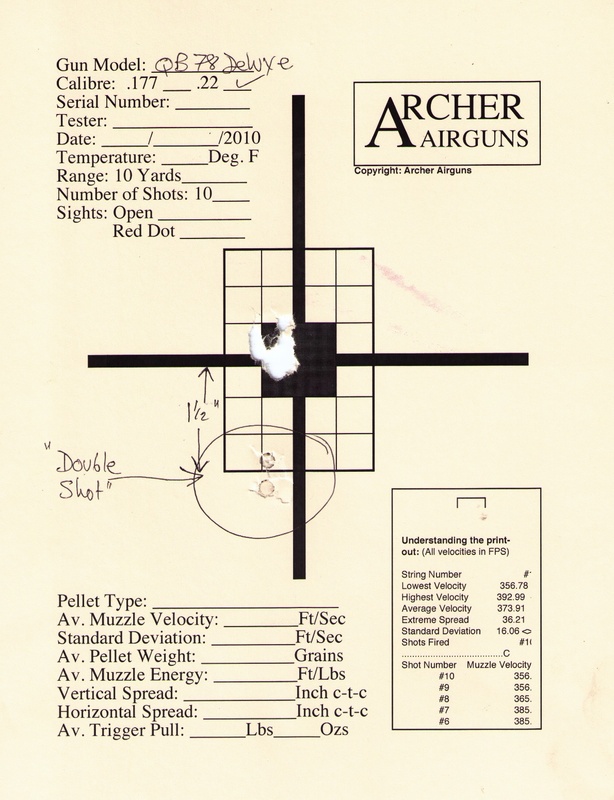 Here's the Crosman 160 / QB78 HDD test target. As you can see, there were 66 shots - fired one every 30 seconds at 63-64 degrees F - with muzzle velocities above 300fps. That's the same as without the HDD fitted. Here's one of the final test targets from our extensive QB78 HDD test program. It shows a test of the HDD using just one 12g Powerlet with a 59mm (average length) spring and a very light hammer weight of 53g (which was achieved by cutting off the end of a 57g factory hammer). The .22 caliber QB78 was fired once every 60 seconds and I was NOT AIMING at the target. The gun was on a rifle rest, but I was concentrating on exact shot timing, not the point of aim! Anyhow, you can see that, even with just one Powerlet, 30 unaimed shots went into a ragged 3/4-inch hole before the point of impact seriously dropped as the gas was used. 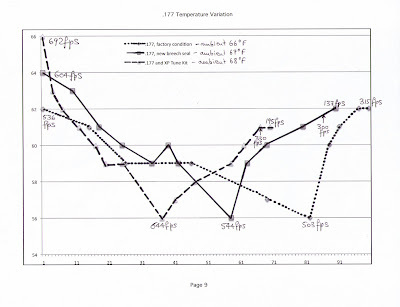 Ambient temperature in the range was 65 degrees F and the gun temperature in this test held fairly constant at 61 - 62 degrees F over the first 30 shots. 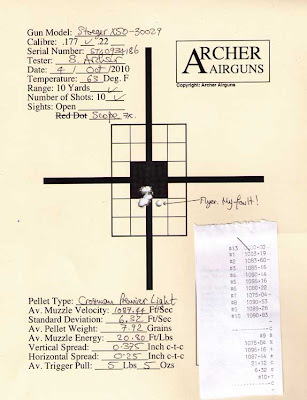 Average muzzle velocity for shots 1 - 10 was 589 fps. For shots 11-20 it was 572fps and shots 21-30 averaged 522fps. 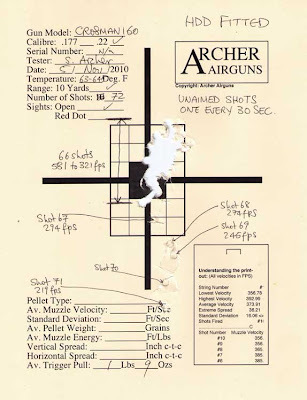 The muzzle velocity did not drop below 500fps until shot 29 (still 502fps at shot 28), but then dropped rapidly. Holding nearly 30 shots before a significant muzzle velocity and point of impact decline for this HDD plus XP Tune Kit combination with only ONE POWERLET compares to previous tests of the XP Tune Kit without HDD but with TWO POWERLETS where about 35 "good" shots were achieved. This was one of many tests where the HDD designed by Steve_in_NC proved it's ability to provide over 40% more muzzle energy from the QB78 than without and how this translates into many more useable shots per fill of CO2. The QB78 HDD is now available. AND IT WORKS REALLY WELL! 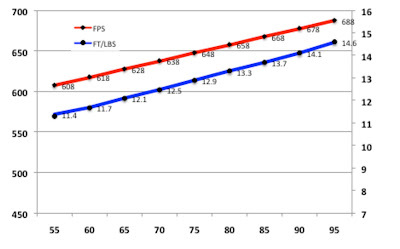 Our tests show that it provides between 40 and 50% greater total energy than a QB78 family air rifle in factory condition. And that means a whole lot more shots per fill of CO2. And no reduction in muzzle velocity takes place either. 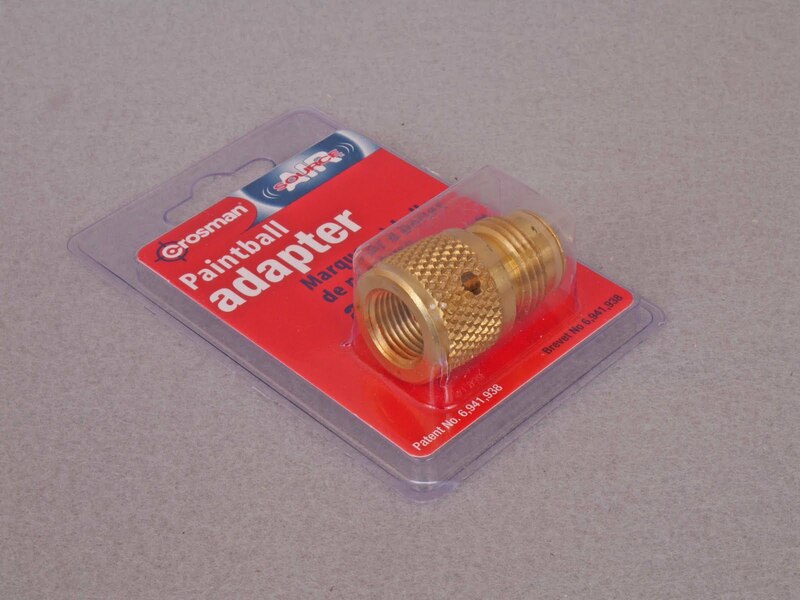 I'm certain that we've given this product far more testing than any other QB78 family aftermarket accessory ever to reach the market - thousands of shots and dozens of installations. All that work has enabled us to really understand why and how the QB78 HDD works, together with its limitations - which are very few. - The HDD will work with all QB78 family models. - It works with the entire range of factory hammer weights. However, it performs somewhat better with lighter weight hammers (59 Grams and below). - It works with all factory hammer springs of 62mm length and less. That's about 90% of the known population of factory springs. Shorter springs give better results. A few factory guns have hammer springs of about 66mm length and these will show a lesser improvement. 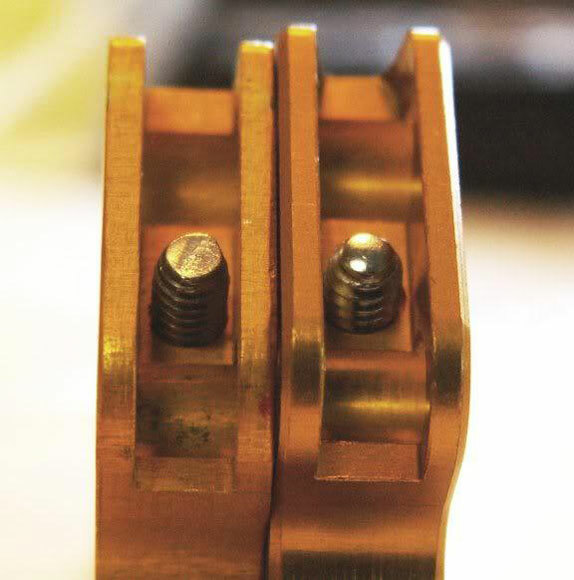 - The HDD works with 90% of the hammer pins in factory guns. For those hammer pins that are too fat, a little gentle filing will provide the required clearance. And we'll have CNC-manufactured pins to the correct dimensions available with the kit shortly. - As the HDD requires friction against the hammer pin slots to work, it will not work in guns where the surfaces of these slots have been smoothed, such as can be done in tuning. - It works with the XP Tune Kit. The XP/HDD combination gives tremendous performance from any QB78 air rifle without the need for an expensive tune. And you can do it yourself! - The HDD significantly reduces temperature fluctuations in the main tube compared to a stock gun. These temperature changes are less marked due to the better use of gas and they result in less shot-to-shot differences in muzzle velocity. More consistent shooting is the result. - Installation requires a different technique from that I normally describe. So we've written careful and explicit instructions for how the HDD should be installed. Thanks for your patience. I know that many of you have been waiting for this hammer debounce device. I'm glad to confirm that it's now ready for prime time. You can see it on our website. Stop Jawing About It and… Just Do It! 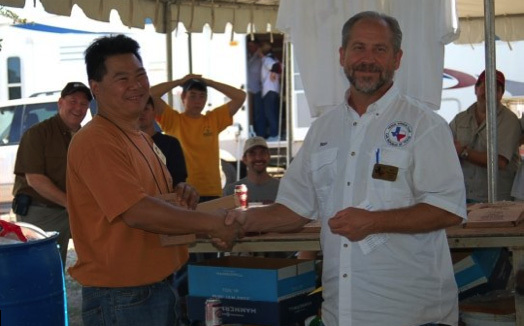 Recalling how excited I was to discover organized airgun competition and how quickly I jumped at the chance to enter my first silhouette match, it seems strange how many airgun enthusiasts procrastinate and/or are intimidated to enter their first silhouette or field-target competition. 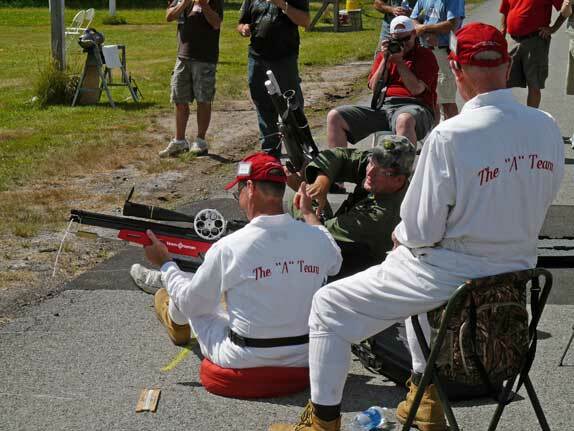 Perhaps it’s performance anxiety (fear of a poor showing), but many airgunners simply cannot seem to “pull the trigger” (so to speak) when it comes to entering their first match. Many are attracted enough to these airgun games to participate in on-line forums with posts and questions, yet are apparently repelled by some unexplained force. While I can see why one might be hesitant to attempt such a demanding discipline as ten-meter competition, reactionary-targets like silhouettes and field-targets hardly lend themselves to structured venues or up-tight participants. And while I’ve heard field-target shooters referred to as “elitist”, truth is the only “elite” thing about them is their shooting skills. After years of field-target and decades of airgun silhouette experience, I can state unequivocally that neither discipline attracts a pretentious following, and the term “discipline” is in fact a misnomer for either game. A much more accurate description than the “elitist” comment mentioned above was overheard from a spectator at a Texas State Silhouette Championship, “It’s a bunch ‘a grown men shooting BB guns at little metal animals!” How intimidating can that be? To the silhouette and field-target-curious out there in Airgunland procrastinating their first competition out of whatever misguided fear one conjures to avoid discovering some of the best airgun fun to be had with like-minded individuals, I feel compelled to give one piece of advice. "Try it... you'll like it!" A pretty up-tight bunch - just look at those scowls! Here's some test results that show why you should keep 12 Gram CO2 Powerlets in the pocket of your jeans before loading them into your QB78 family air rifle. Oh yes, and then wait for 3 minutes before beginning to shoot. It can make 20fps difference to muzzle velocity! I made 10 tests, each time loading a QB78 air rifle with two full standard 12 Gram Powerlets. In every case, I had warmed the Powerlets in the pocket of my jeans for about 30 minutes beforehand. 1) The ambient (room) temperature. 2) The initial temperature of the gun before loading Powerlets. 3) The temperature of the gun immediately after the warm Powerlets were loaded. 4) The temperature of the gun immediately after piercing the Powerlets. 5) The temperature of the gun after waiting 3 minutes. On average, the guns started at approximately room temperature - 67 or 68 degrees. So, we can see that the temperature of the gun rose by about 7 degrees F immediately after loading with the warm Powerlets. 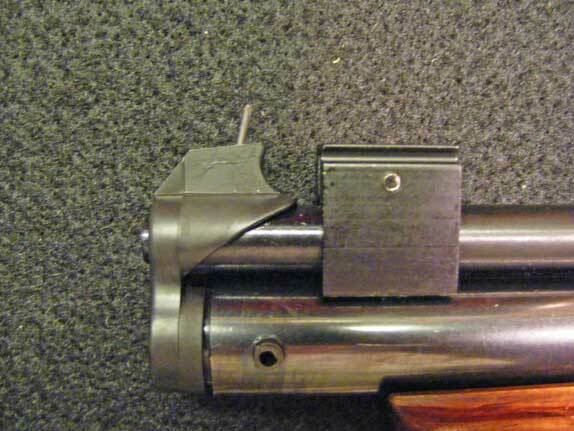 Piercing the Powerlets caused the temperature of the gun to fall by 10 degrees. 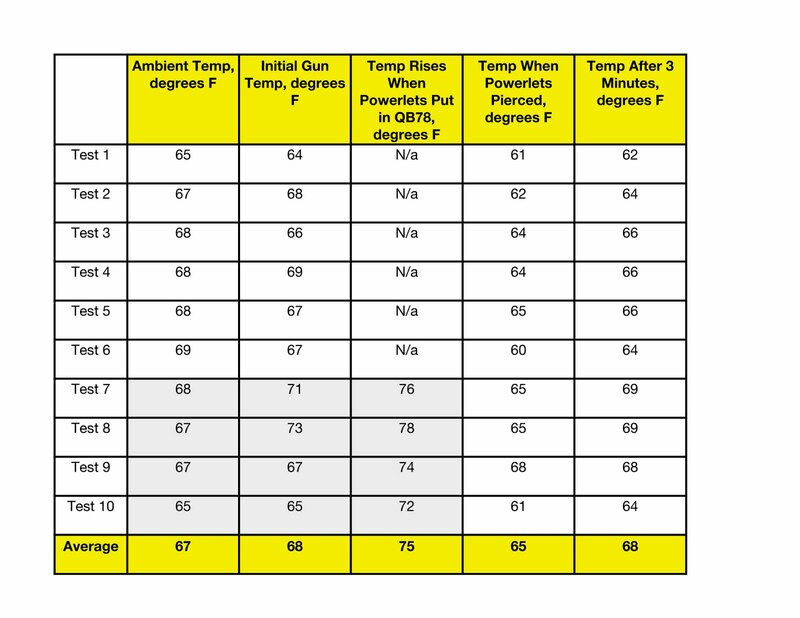 Gun temperature stabilized at about ambient temperature again after 3 minutes in ambient temperatures of 65 to 70 degrees F.
- Keep Powerlets warm before use. - Wait for at least 3 minutes before starting to shoot your gun. 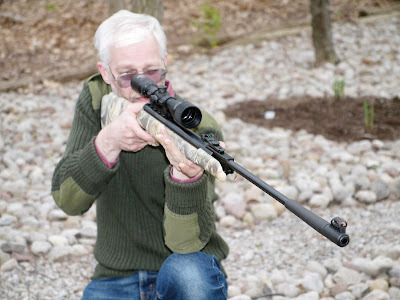 The reason for all this interest in gun temperature is that the muzzle velocity of QB78-family air rifles - like all CO2-powered guns including the Crosman 160 - changes with temperature. 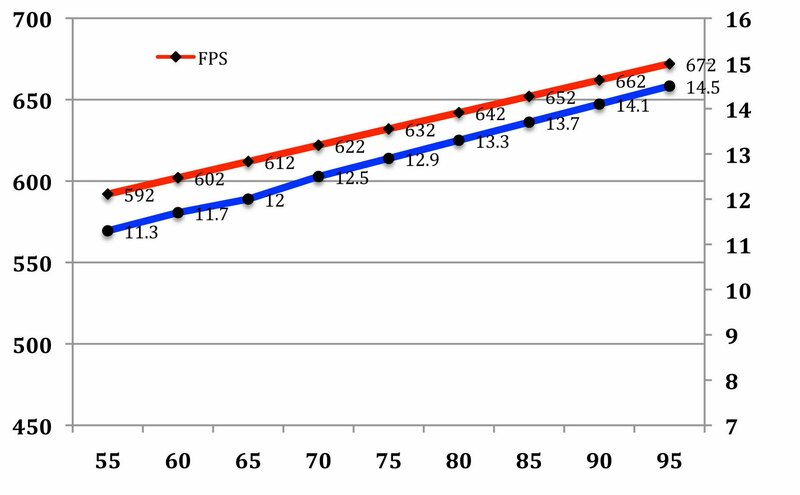 For the QB78, this change is 2fps per degree F. So we see that just piercing the Powerlets in your gun causes the temperature to fall by 10 degrees F. That represents a FALL in muzzle velocity of 20fps! For those of us wanting the best performance from our Q78s, that 20fps makes a big difference, not just to muzzle velocity, but also to the point of impact. Doubtless, the results would be different in higher ambient temperatures (and the differences less marked), but 70-ish has been about the best we have been able to manage in Up-State New York recently. Conversely, I would expect the effect to be more marked at lower ambient temperatures. 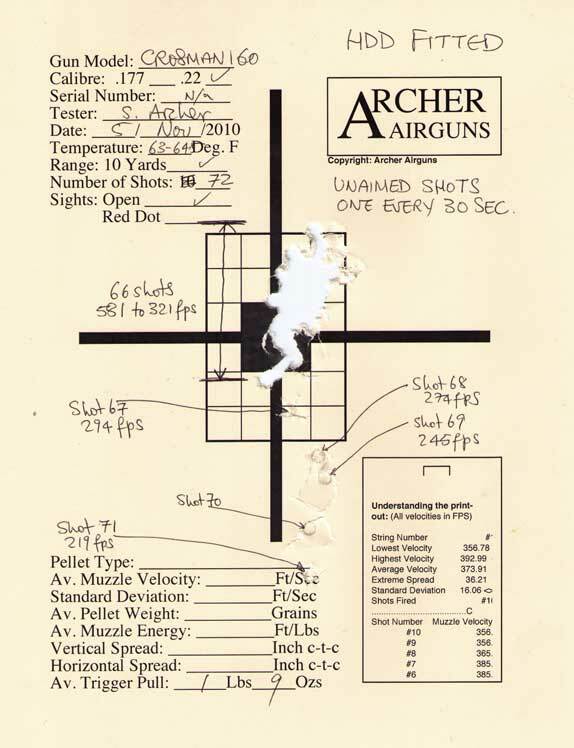 The gun temperature readings were made using the Archer Airguns Temperature Monitoring Kit for QB78. As several folk sent emails saying they found previous "Gold Service" test targets interesting, here's a couple more that have just gone through the shop. The first shows the test target for a .177 caliber Stoeger X50. Here we can see the excellent accuracy out of the box - if I do my part! - displayed by all the X50 guns I've tested so far. As with almost all of these guns, there was no dieseling at all and the Standard Deviation (muzzle velocity variation) is excellent for a brand-new springer. The X50s shoot at approximately 1100fps with CPLs, giving 20+ ft/lbs of muzzle energy. The trigger pull weight on this Stoeger X50 was a little above average, most show less than 5lbs pull weight, but it still felt fine and gave predictable let-off. By way of a comparison, we have a test target for a QB57 Deluxe in .22 caliber. As is Archer Airguns practice, the gun was tested with my trusty Leapers red dot scope. Some QB57s can be very "wet" from the Shanghai factory and show considerable dieseling when first fired, but this one was nicely dry and gave outstanding figures of only 5.38 ft/sec over 10 shots. This is QB78 territory! Trigger pull was very light, too, at only 3 lbs 3 oz. QB57 triggers have a long pull, but a little experience makes them quite predictable. And nearly 10ft/lb of muzzle energy in an accurate, controllable package is pretty good for such a compact air rifle that sells for less than $75.00 and has so few plastic parts. 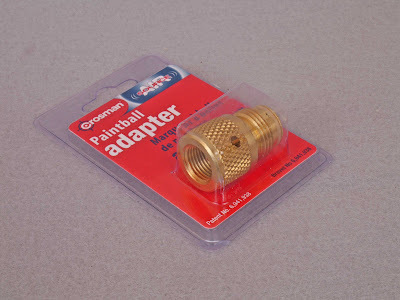 The very useful Crosman 88g AirSource to Paintball Adapter is available again! This is very good news for those QB79 and AR2079 users who like to use the Crosman 88g tanks with their air rifles. They provide a readily-available source of CO2 for these guns with no fear of an over-size paintball tank touching the barrel. Each 88g tank provides around 220 shots when used with a QB79 or AR2079 in factory condition. 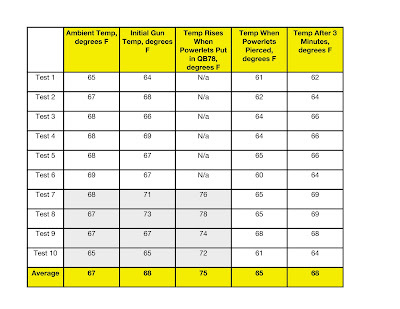 Now we can really understand temperature effects on our QB78 family air rifles! I've always been interested in the effect of temperature on CO2-powered air rifles such as the Crosman 160, QB78 and Crosman 2260. As all CO2 air rifles exhibit a change in muzzle velocity with changes in temperature - due to the physical properties of CO2 - I've tried to measure this effect in the past. 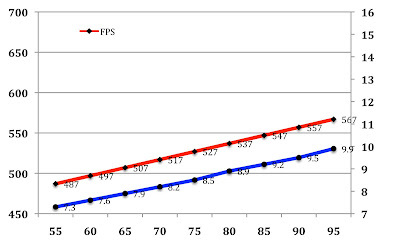 In tests, I found that QB78 family air rifles - such as the QB79 and AR2078 - all show an increase in muzzle velocity with temperature of 2 fps per degree F. So, a gun shooting at 600fps at 65 degrees F will shoot at 640pfs at 85 degrees F, due to the effect of temperature alone. 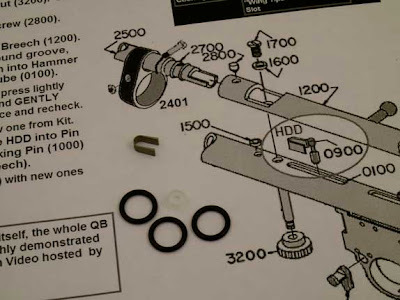 And I measured the point of "valve lock" on a QB78 air rifle to be at 96 degrees F.
But, like everyone else, I've concentrated on the air temperature to measure these things. 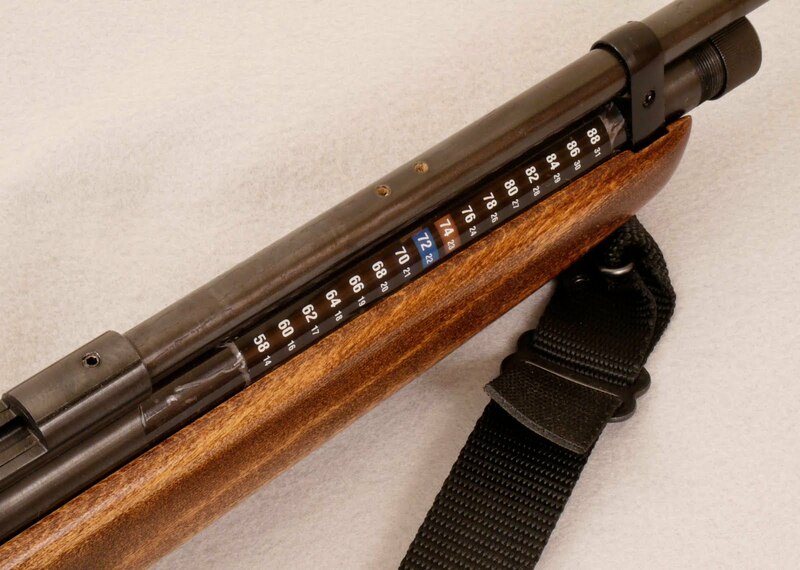 Now, there's a completely new way to measure the temperature of your QB78 family air rifle. It's the Archer Airguns QB78 Temperature Monitoring Kit. Thanks to the suggestion of Rochester-area airgunner Doug Wall, Archer Airguns has introduced a simple kit that allows you to monitor the temperature of the CO2 in the gas tube of your air rifle. This kit uses self-adhesive thermometers that attach to the main tube of the gun and, therefore, measure the temperature of the gas tube rather than the surrounding air. These thermometers allow measurement of main tube (and therefore CO2) temperature to 1 degree F. If the temperature is highlighted in green, it's exactly the value indicated. Brown highlight shows that the temperature is just above the temperature, while bluehighlight shows a figure just below. 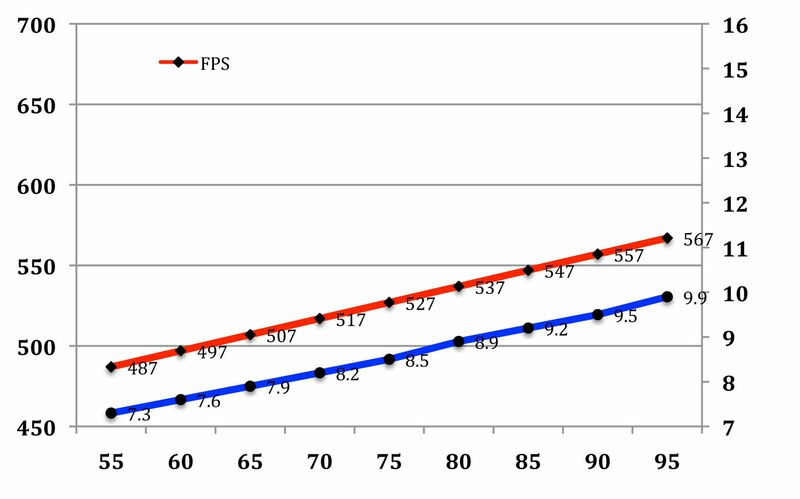 In this way, you can see differences in muzzle velocity of 2 fps! Here, the thermometer shows a main tube temperature of 73 degrees F.
You can use this kit to maximize the muzzle velocity of your QB78 air rifle. In testing, I found that simply piercing a fresh pair of 12 gram Powerlets in a QB78 reduced the main tube temperature by 10 degrees F. That's a loss of 20fps! And, using the Temperature Monitoring Kit, I saw that it took 5 minutes for the temperature of the main tube (and, therefore, the CO2) to return to 65 degrees, re-gaining 10 fps in muzzle velocity in the process. As the Archer Airguns QB78 Temperature Monitoring Kit is new, there's lots of information on the performance of our favorite air rifles that can now be explored in a way that was previously unattainable. Watch out for more data, or use the kit yourself and contribute to our increased understanding of how these air rifles really behave! Day two of the Crosman-sponsored FT shoot saw an excellent shoot in perfect weather. Somewhat cooler than yesterday, there was no rain - just some wind to disturb the shooters on the more open sections of the course. The WFTF rules contest saw Ray Apelles and Harold Rushton shoot identical scores. The winner was decided by a 55-yard "sudden death" shoot off with Harold the winner. Below, Harold and Ray congratulate each other after the shoot off. Above. Art Duel prepares to shoot. 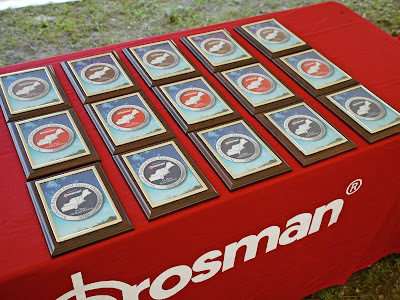 Crosman supplied a wonderful range of "door prizes" that were distributed at the conclusion of the shoot. The many lucky winners - whose name was pulled out of the hat (well, actually a paper cup!) - won pellets, knife sets, Center Point scopes (not cheap ones either) and air rifles. There was also a large selection of plaques, one each for first, second and third prize winners in each category. Photo below. And, out for pubic viewing, was the most interesting prototype "tactical" Marauder shown below. I want one!!! 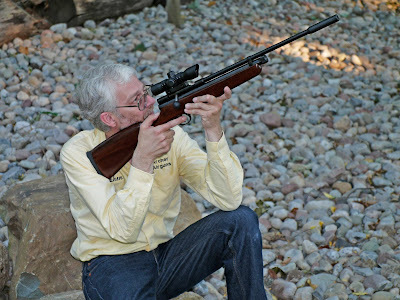 Everyone who attended agreed that it was a fine shoot and that Crosman hosted it fabulously. Don't miss this event next year! Today was the first day of the Northeast Regional Field Target Championship held at the Crosman headquarters in Bloomfield NY. 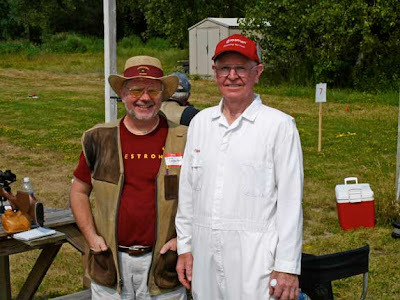 The match was directed by Hans and Ray Apelles, while Crosman supplied the venue and logistics - including much needed cold drinks as the temperature hovered in the mid 90s with high humidity until well after Noon. 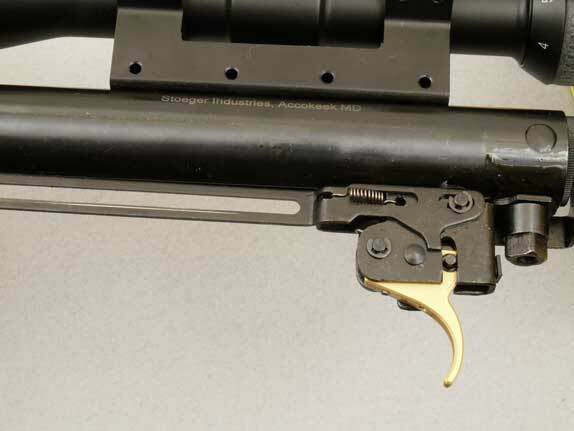 Those of us fielding QB78 air rifles suffered from valve lock in the intense heat! Hans Apelles and Dave Carpenter enjoy the practice session. The morning offered open practice on the range, which was set-up on the former Crosman paintball field. 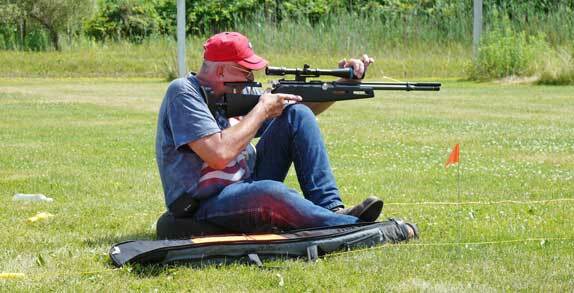 Around 64 competitors registered to shoot - by my count, at least - and many were there for the practice session. 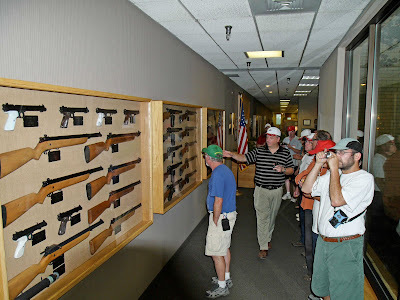 A highlight of the day for many of us was a guided tour of the Crosman factory. Around 50 people took the tour, divided into three groups. I joined the group led by Crosman Director of Manufacturing Ed Schultz. We were saw all aspects of the facility, from the stock making shop to pellet production, the airgun assembly lines, barrel rifling, Powerlet manufacturing - VERY noisy but so interesting, the experimental shop and the Crosman Museum. 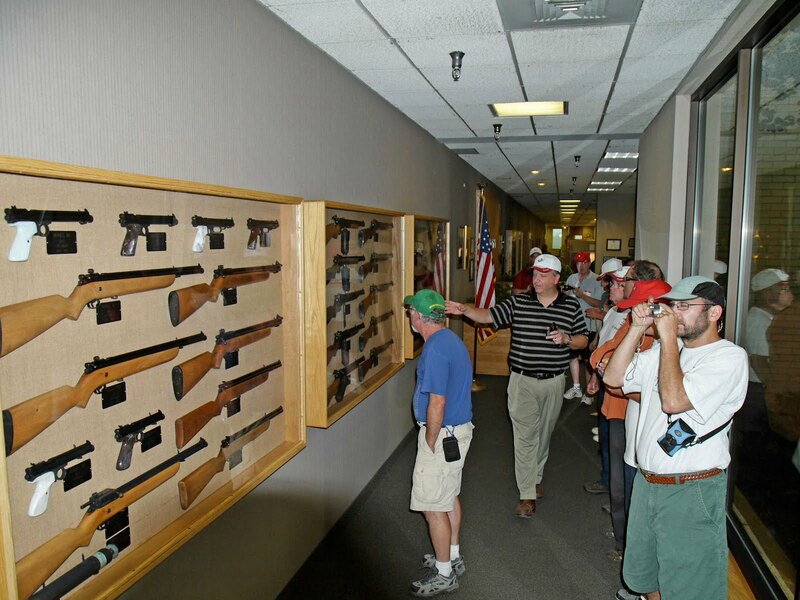 Crosman Manufacturing Director Ed Schultz (center) guides us through the Crosman Museum. An afternoon cloudburst cut the heat, but did nothing to dispel interest in the "Quigley Bucket Challenge" contest. That's 5 shots per competitor at a 1.75-inch bucket at 55 yards range with a 6.5 ft/lb limit muzzle energy limit and iron sights only. Amazingly, this contest went to a tie-breaking shoot out with Paul Bishop being the winner. Great shooting! I noted with interest that the only shooters to hit the target did so after it started raining - go figure! We've had several emails about the performance of our CAR78a carbine with the Archer Airguns "XP" Tune Kit, so it seems a good idea to publish this post with some details. - A standard QB78 in .177 typically shoots about 600fps at 65 degrees F.
- The shortened barrel of the carbine reduces this to about 560fps. - Replacing the breech seal (which I do as standard in the newer carbines) raises muzzle velocity back up to around 600fps. - Adding the XP bolt increases the muzzle velocity to around 650fps at 65 Degrees F.
These muzzle velocities are all as shot at about65 degrees F with heavy wadcutter pellets. Shooting lighter, pointed, pellets will raise the muzzle velocity. And, like all CO2 guns, shooting in warmer temperatures will increase muzzle velocity. In the case of the QB78 family air rifles, this increase is about 2fps per degree F. So, shooting heavy, wadcutter pellets at 85 degrees F, a CAR78a will give about 700fps in .77 caliber. Over the past few years, Archer Airguns has sold thousands of our Oversize Bolt Handles for the QB78 family. 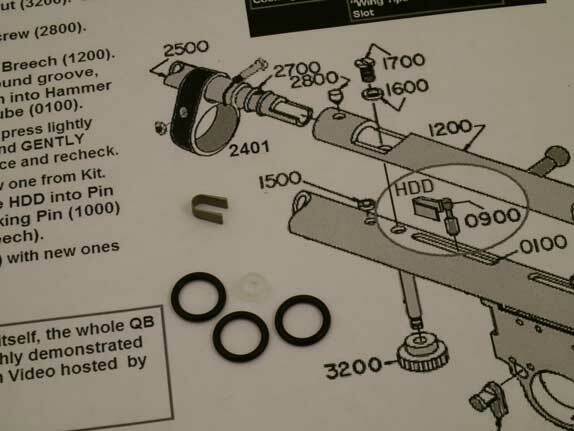 And we're already moving into the hundreds of sales for our QB78 Family XP Tune Kit that require the bolt handle to be removed as part of the installation. Over all those bolt handles, there have been very, very few cases where it has not been possible to remove the existing factory bolt handle quite easily once the setscrew has been removed. But, there's always an exception! And interestingly, each of these few bolt handles that have been tough to remove have been on Q78 Deluxe air rifles. 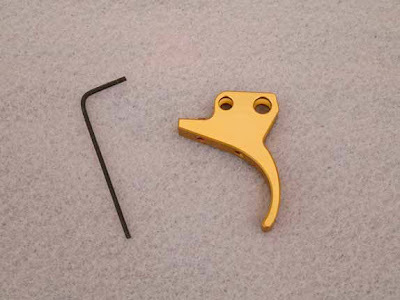 Maybe there were a few oversize "gold" bolt handles in one production batch - and undoubtedly the factory folk never expected to find us shooters removing them to replace with an Oversize Handle or to install a Tune Kit! 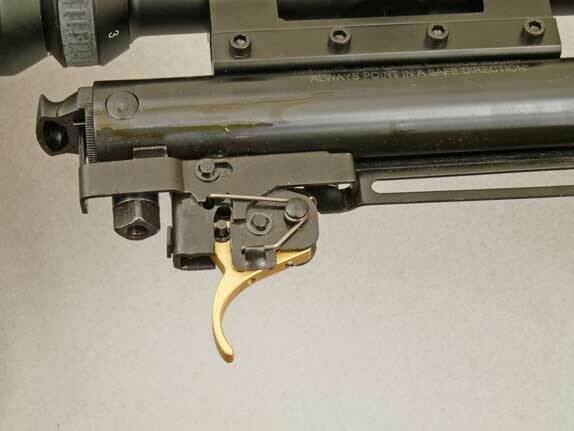 So what should you do with a hard-to-extract QB78 bolt handle? The photo below shows how. Remove the breech assembly and clamp the bolt handle in the padded jaws of a vice. Now wriggle and pull a little and the bolt handle will come out. It's worked every time so far! Here are the results from Archer Airguns first "Gold Service" test of a customer's Stoeger X50 air rifle. 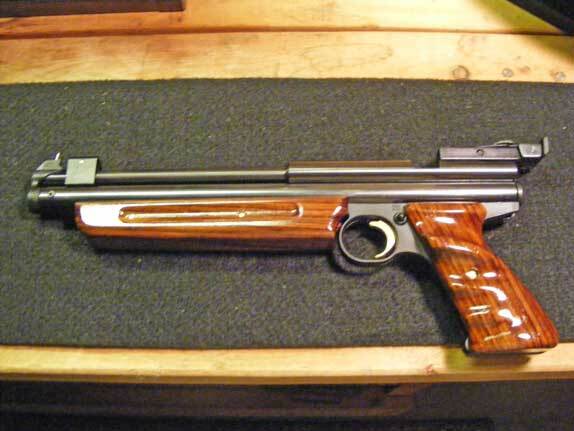 This is an excellent airgun and it was a pleasure to ship such a nice air rifle to our first X50 customer! Standard "Gold Service" testing conditions: indoors, 10 shots at 10 yards range, muzzle velocity, accuracy and trigger pull tested. - Average muzzle velocity 1,100.5 fps with 7.93 Grain Crosman Premier Light pellets. - Standard deviation 5.38 fps. - Muzzle energy 21.33 ft/lbs. - Group size 0.5-in vertical, 0.75-in horizontal, CTC. - Muzzle velocity matches the claimed 1,200 fps with lead pellets fairly well. - Accuracy is better than I can shoot it! Twice I put successive pellets through the same hole, but I'm not a good springer shot (not consistent enough) and my group drifted out horizontally as I shot. I'm sure the customer will do better than me! - Dieseling was almost completely absent. 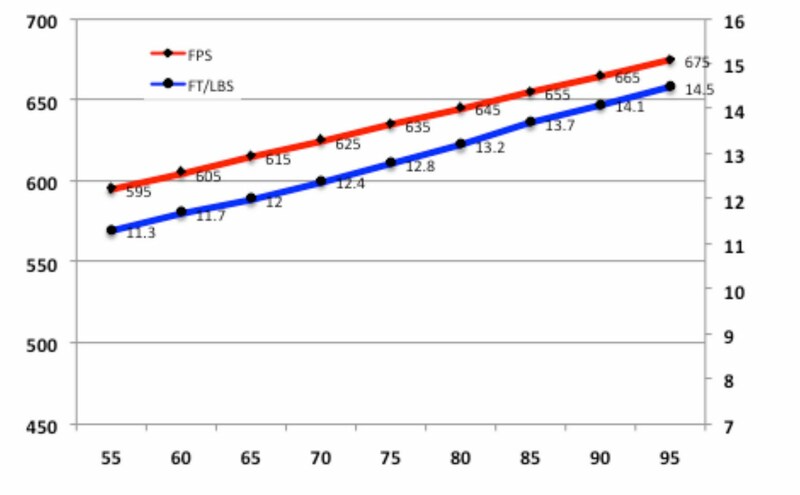 Shot-to-shot consistency (Standard Deviation) was very good for a springer at 5.38 fps over 10 shots before the gun is broken-in - that's average consistency for a QB78, for example. - Trigger pull was much lighter than expected. In fact I double-checked the reading to be sure. - This is a BIG air rifle! I'm 6-ft 2-in tall and I had to stretch to break the barrel. - Scope is fine and I obtained a good cheek weld against the Monte Carlo-style stock comb. - Operation was smooth and good. - Surprisingly comfortable to shoot for such a large air rifle. The scope is pre-mounted and quite well sighted on target - certainly shootable out of the box with only minor sighting-in required for personal vision and pellet combinations. I'm impressed with what I've experienced of the Stoeger X10, X20 and X50 air rifles so far! Stephen shooting a Stoeger X50 Scope Combo. Stoeger air rifles are new to the Internet and Archer Airguns is proud to have been appointed an official Stoeger Airguns dealer by Benelli USA. To start, we're offering the X10, X20 and X50 models. These airguns are made in China by BAM and they're really good spring-powered air rifles for the fair price that's being asked. 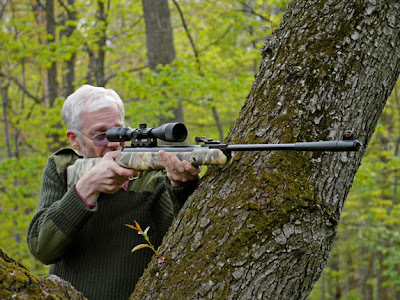 All Stoeger air rifles benefit from a 2 year warranty and most of them are fitted with ready-mounted airgun rated scopes that are bore sighted at the factory. This means that you can take your Stoeger air rifle combo out of its box, start shooting immediately with the scope and be on target. And, Archer Airguns will stand behind the performance with our "Gold Service" testing - for a small additional charge the rifle will be inspected and test fired. "Gold Service" tested guns will be supplied with a test target showing accuracy, muzzle velocity and trigger pull. You can read more on our site. The X10 and X20 models shoot lead free pellets at very close to the claimed muzzle velocity of 1200 fps, while the monster X50 model shoots them at 1500 fps. As you will expect, I've undertaken extensive testing before introducing the X10, X20 and X50 air rifles and will share this information soon on this blog. 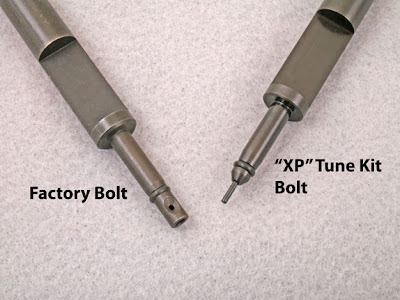 This is our third post on the new Archer Airguns "XP" Tune Kit. You can see the others by using the search box and scrolling down the page. Several people have asked for more detail on the number of shots available from one set of Powerlets when using this tune kit. 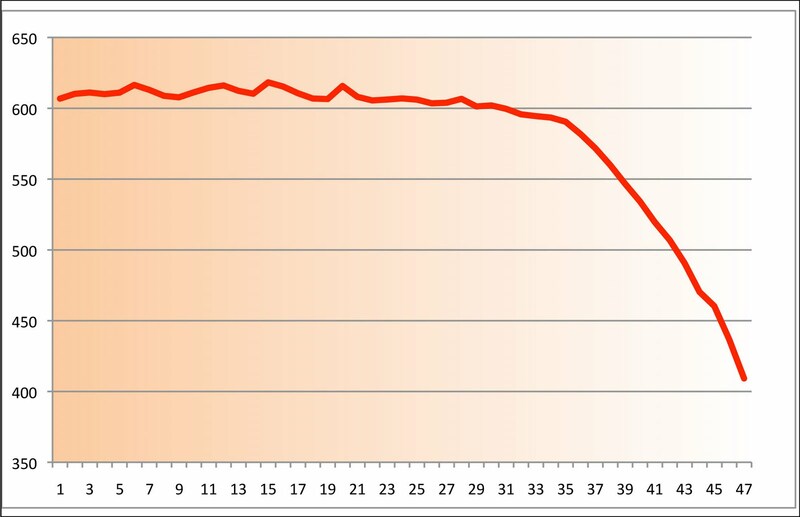 The graph below shows shows the muzzle velocities for 47 shots fired from our QB78 Deluxe test gun in .22 caliber. As you can see, muzzle velocity remains fairly consistent until shot 35 and then falls off rapidly. Normally, .177 guns give more shots per fill and I would expect the same with the "XP" Tune Kit, although I've not tested that yet. 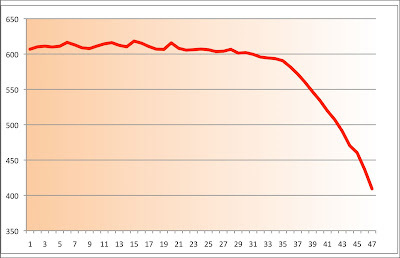 The left axis of the graph shows the muzzle velocity per shot, the horizontal axis indicates the number of shots fired. This graph tells us that you will see about 35 "good" shots until the point of aim starts to fall significantly due to use of gas. This compares to about 50 "good" shots for a QB78 in factory condition, but of course we're using more gas per shot to obtain the increased muzzle velocity. But it's still not a bad compromise for the increased power! This testing was undertaken at 62 degrees Farenheit, that's why the muzzle velocity hovers in the 600 - 615 fps range for most of the shots. As with all CO2 guns, muzzle velocity increases with ambient temperature, in fact by about 2 fps per degree F. Had this test been undertaken at 85 degrees F (for example), the muzzle velocities would have been in the 645 - 660 fps range instead. These Crosman 160 clones are great. Who’da thunk it?! 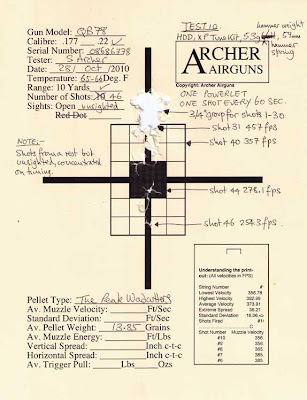 Greetings fellow airgunners, and thank you Stephen for inviting me to participate in the Archer on Airguns blog. I appreciate the opportunity to share my opinions and experiences, and hope to contribute something(s) of value to the dialogue. Long an aficionado of Crosman collectable airguns, I was both surprised and put-off that the Chinese would have the audacity to reproduce the highly-venerated, classic Crosman 160 and 167 models with the QB line of CO2 rifles. Such heresy! However, having failed to locate a .177 Crosman model 167, I soon had a QB77 Deluxe (clone) on order. When the first three-shot group at fifty yards went into .30” center-to-center, I knew the QB was something special. The next two groups measured .40” and .50” center-to-center, converting me from disbeliever to QB devotee in less than ten shots! 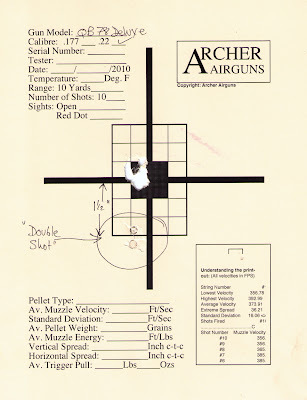 Having proven my .22 Crosman 160 infatuation more than simply a nut-case obsession in silhouette competition, I felt the incredible accuracy displayed by my .177 QB had real potential for field-target competition… if not for its mediocre power and variable trajectory (with temperature fluctuation). When a few individuals began converting QBs to high-pressure air (HPA), I took immediate notice, and converted my own at the first opportunity. The customized QB has well lived up to all expectations; most recently capturing a strong second place at the 2009 U.S. Field-Target National Championships in Hunter Class. That the first and third place Hunter rifles were the highest state-of-the art, competition-specific field-target rifles produced today, costing SIX TIMES that of my custom QB, vindicated my QB obsession as something more than just blind faith. In reproducing the fine classic Crosman Model 160/167, Chinese industy has gifted American airgunners with not only an incredible (and incredible-shooting) bargain, but an awesome platform for customizations ranging from simple cosmetic make-over to world-class custom competition rifles. Who’da thunk it?! Archer Airguns is introducing its "XP" Tune Kit for QB78 family air rifles. This kit enables you at easily increase the muzzle velocity of any QB78 family air rifle by 100 fps, including the QB79, AR2078 and AR2079 as well as the identical Tech Force TF78, TF79 etc models. 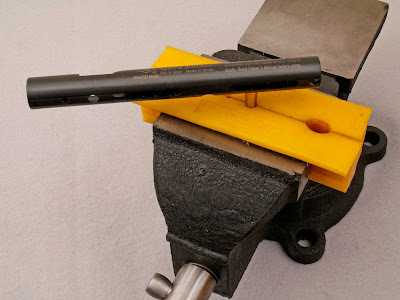 This tune kit takes .22 caliber muzzle velocities for QB78 family air rifles from about 530 fps at 75 degrees F to around 640 fps at the same temperature, increasing the muzzle energy from around 8.5 ft/lbs to about 13 ft/lbs as it does so. This makes the QB78 family much more suitable for hunting and longer range shooting. And it's all done just by replacing two parts in the gun. 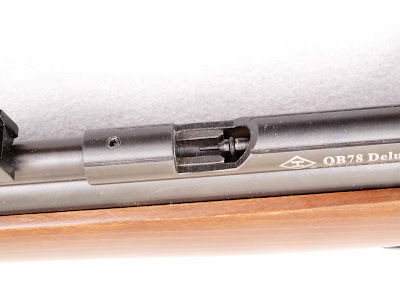 In this post we'll look at test results, all shot from the same .22 caliber QB78 Deluxe. 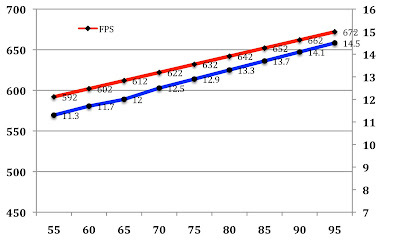 The results are shown as graphs. The top line represents muzzle velocity and is read against the left axis. 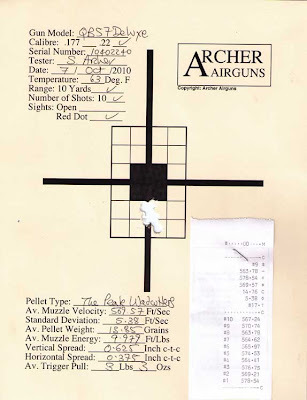 The lower line shows the muzzle energy and is read against the right axis. The figures along the bottom give the temperature in degrees F as - like all CO2 guns - the performance varies with temperature due to the physical properties of the gas. In every case, higher is better! 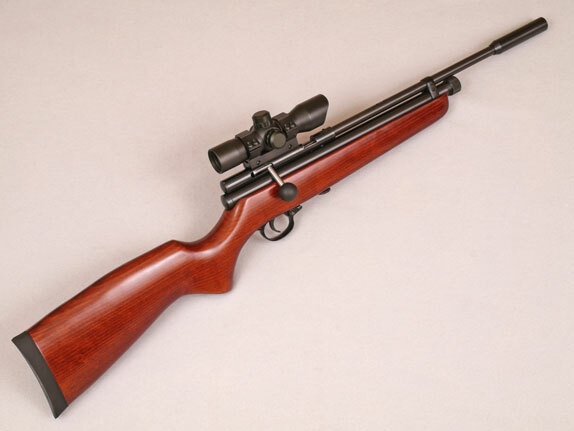 First, we see the performance of the stock, .22 caliber factory gun. Next, we see the same gun, same pellets, fitted with the "XP" Tune Kit. Note the difference! In confirmation of the improved performance, I tested the tuned gun with heavy RWS Superpoints, as follows. As you can see, the results were very similar. And finally, we have another test, this time with Crosman Premiers. 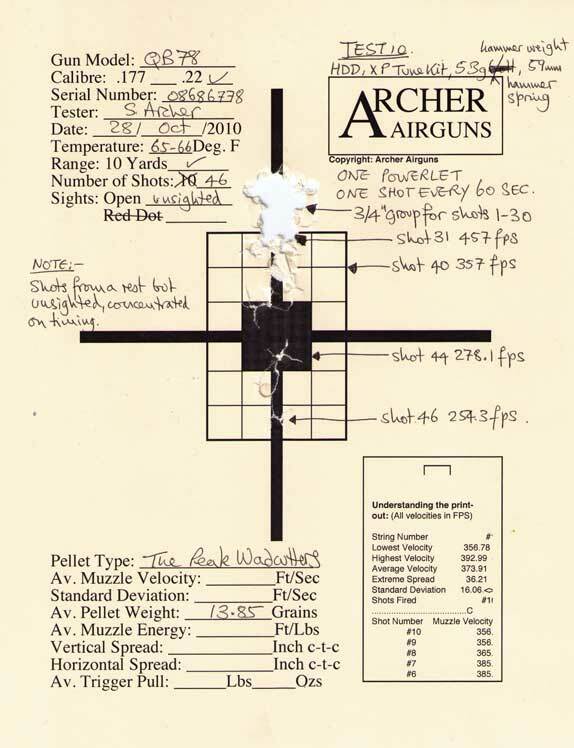 Again, the gun is shooting at just under 13 ft/lbs at 75 degrees F.
And the down side to this improved performance? The shot count drops to about 35 shots per fill, from 50 in factory tune. But, in my opinion, that's not a bad trade-off for such improved performance! Either you can buy the "XP" Tune Kit and do it yourself, or I'll fit it to QB78 family air rifles purchased at the same time for a small fee.